The Cesar dog food brand is easy to identify as the brand that features a picture of a West Highland White Terrier on all of their pet food products. This brand states that it is their mission to, “provide food that your furry best friend will love, made with the nutrition and quality every dog deserves”. Cesar states that their brand is designed to offer a wide variety of options for pet owners to choose from, all at an affordable price point. When you pick up a tray of wet food you’ll see the happy Westie featured front and center along with a picture of tasty ingredients cooked up in a pate or blend. Before you decide to offer your dog this brand, however, you would do well to read some Cesar reviews to determine whether this brand is a good fit for your dog – you can’t always believe what you read on a pet food package or even on the company’s website. The Cesar dog food brand is produced and manufactured by Mars, Inc. Though primarily known as the maker of popular candy bars, Mars, Inc. is actually the sixth largest privately held company in the United States and a global manufacturer of pet food. This company was founded in 1911 and they have acquired or developed dozens of brands over their 100-year history. Some of the other pet food brands produced by Mars, Inc. include Eukanuba, Greenies, Iams, Nutro, Pedigree, Pill Pockets, Royal Canin, Sheba, and Whiskas. The pet care division of Mars, Inc. is headquartered in Franklin, Tennessee, though they have manufacturing facilities all over the U.S. and Canada – they even have a few plants in Europe. Some sources say that Cesar foods are all manufactured in the United States but there is no information provided on the company website to back up this claim. In fact, their product labels don’t even carry the “Made in the USA” statement that many pet foods do. This doesn’t necessarily mean that their products aren’t produced in the USA, but we can’t confirm or deny it. Not only does Cesar provide very little information about where their products are made, but they also don’t speak to the sourcing of their ingredients. If you quickly review the ingredients lists for several of their products, you will find that they use a variety of meat by-products as well as artificial additives including colors, flavors, and preservatives. Cesar dog food reviews are often not very positive because the brand uses so many low-quality ingredients. Keep reading to find our review for this brand. In October 2016, the FDA issued a recall for a single flavor of wet food due to potential choking hazards from small pieces of plastic in the food. The product affected was the Classics Filet Mignon wet dog food sold in 3.5-ounce trays and variety packs. One of the reasons Cesar dog food is so popular among pet owners is that it is inexpensive and easy to find. You can typically buy this brand of pet food in grocery stores, big box stores, and pet stores – their products are also available online from many pet food retailers. It is also easy to find Cesar coupons on the brand website as well as from independent and online retailers. How Expensive Are Their Products? Again, this brand is very inexpensive and you can save even more using Cesar dog food coupons. You can purchase 24-packs of wet food trays for between $15 and $30 for most recipes – that averages to about $0.94 per tray. This brand of dog food offers 12-pound bags of dry food for about $15 and their treats sell for less than $10 for an 18-ounce bag, in most cases. As you may already know, the Cesar dog food brand is primarily a wet food company, though they do offer a very limited selection of dry foods and a small assortment of treats. This brand markets their products as being made with real meat flavors such as grilled chicken, roasted lamb, and filet mignon. The important thing to note about these products is that while they may be made with those real meat flavors, they often do not contain the actual meat itself. If they do, it is typically paired with a lower quality (less expensive) meat product like chicken by-product meal or meat and bone meal. This brand of dog food is very popular, but mostly because it is easy to find and relatively inexpensive. Unfortunately, many of the pet owners who buy this brand for their dog are taken in by the pretty pictures and the health claims made on the packaging – they don’t always take time to review the product for themselves. If you were to review even one of this brand’s recipes you would find that it might not be the kind of food you want to offer your own dog. While many of Cesar’s recipes start with real meat as the first ingredient, they are closely followed by by-products as well as corn and wheat ingredients. Many of this brand’s recipes are high in carbohydrates and they make heavy use of unnamed ingredients – things like meat meal rather than chicken meal. The guaranteed analysis for many products puts the protein and fat content within the appropriate range, but the quality of the ingredients used to determine those values is important. Below you will find our reviews for one dry food and one wet food product. Cesar Slow Roasted Lamb Flavor & Spring Vegetables Dry Food Formula – The Slow Roasted Lamb Flavor & Spring Vegetables Dry Food Formula is described as a succulent dinner fit for a best friend. The Cesar website states that it is full of slow-roasted lamb flavor with the nutritional benefits of spring vegetables. It is nutritionally complete for dogs in all life stages with the exception of large breed puppies – it is, however, complete for small-breed dogs. The package for this recipe features a picture of the brand’s Westie as well as a picture of roasted lamb shanks with fresh green peas – this image may lead pet owners to assume that these are the main ingredients in the product which may not be entirely true. The first ingredient in this formula is fresh lamb but it is followed by chicken by-product meal and ground yellow corn. Fresh lamb as a first ingredient is definitely a good thing, but you have to wonder how much it actually contributes to the total protein content of the recipe when other low-quality protein sources like chicken by-product meal, meat & bone meal, and corn gluten meal are all featured within the top 10 ingredients. Ground yellow corn does contain some plant protein but it, along with the ground wheat, is primarily used as a carbohydrate ingredient. 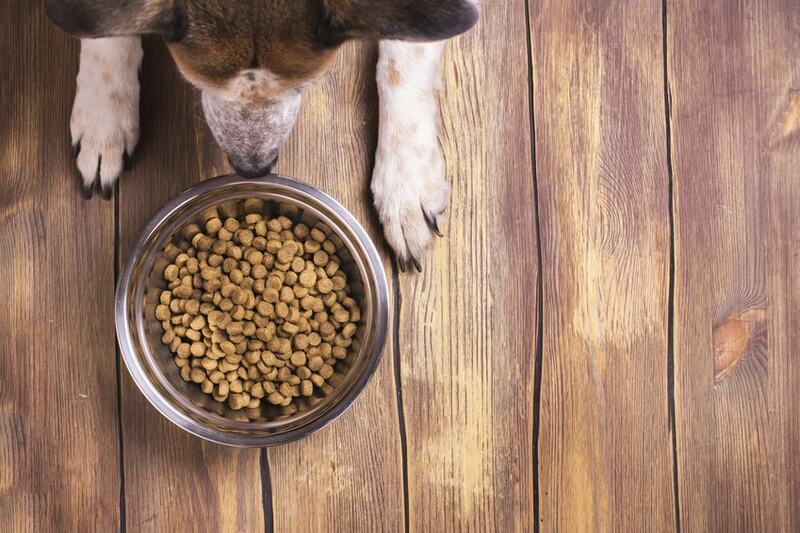 Unfortunately, these ingredients are two of the most common dog food allergies and many dogs find them difficult to digest. It is also worth noting that this product includes generic animal fat, several artificial colors, and an assortment of synthetic supplements, none of which are chelated to improve uptake. This Slow Roasted Lamb Flavor & Spring Vegetables Dry Food Formula is formulated to meet the nutritional levels established by the AAFCO Nutrient Profiles for all life stages except for growth of large size dogs (70 pounds or more as an adult). Overall, this Slow Roasted Lamb Flavor & Spring Vegetables Dry Food Formula is not the worst product on the shelf, but you can definitely do better. This formula starts off strong with fresh lamb as the first ingredient but with multiple plant proteins and unnamed meats following close behind, it is hard to tell how much this ingredient actually contributes to the total protein content of the formula. This recipe loses points for the use of corn, wheat, and soy products as well as artificial colors. Other questionable ingredients include sugar, dried beat pulp, and brewers rice. Cesar Home Delights Slow Cooked Chicken & Vegetables Dinner in Sauce – This Home Delights Slow Cooked Chicken & Vegetables Dinner in Sauce formula wet food is supposedly made with simmered chicken and healthy vegetables like potatoes, carrots, and peas. It belongs to the Home Delights line of wet foods cooked in sauce and it comes in a 3.5-ounce tray. This particularly recipe is formulated to meet the nutritional needs of adult dogs, particularly small-breed dogs. The first ingredient in this recipe is water sufficient for processing. Though it would be a problem to see a non-meat ingredient as the first ingredient in a dry food, water or broth is commonly used as a first ingredient in wet foods to maintain the high moisture content. The second ingredient is chicken, a high-quality source of animal protein. Next comes another quality ingredient – chicken liver. This contains not only plenty of complete protein, but chicken liver is also rich in nutrients. Unfortunately, the product goes downhill after that with meat by-products as the fourth ingredient, wheat gluten as the fifth, and cornstarch as the sixth. Though chicken is the main form of protein, it is difficult to tell how much of the total protein content comes from that ingredient versus the unnamed meat by-products and the plant proteins in wheat gluten. In addition to being made with several questionable proteins, this Home Delights Slow Cooked Chicken & Vegetables Dinner in Sauce formula also includes some low-quality carbohydrates. Cornstarch and wheat flour both contain ingredients that have a high risk for triggering food allergies in dogs and they may be difficult for most dogs to digest. Add to that the fact that they offer limited nutritional value and you can see the problem. This formula does include dried potatoes, dried carrots, and dried peas for carbohydrate energy, dietary fiber, and nutrients, but they are just a few ingredients in long list of questionable ingredients. It is also troubling to see that there isn’t a high-quality source of animal fat and that none of the synthetic minerals are chelated. You should also note the inclusion of added colors. This Home Delights Slow Cooked Chicken & Vegetables Dinner in Sauce is formulated to meet the nutritional levels established by the AAFCO Nutrient Profiles for maintenance. Overall, this Home Delights Slow Cooked Chicken & Vegetables Dinner in Sauce formula is probably not something you want to be feeding your dog. Though it starts off well with two high-quality chicken ingredients, the rest of the ingredients on the list offer minimal nutritional value at best and some of them are highly questionable. It is also important to note the inclusion of common dog food allergens in the form of corn and wheat ingredients. This recipe could benefit from the addition of a high-quality source of animal fat as well as some more beneficial supplements like chelated minerals and probiotics for healthy digestion. All in all, it is not one of the better dog foods out there. You are so quick to bad-mouth all this food with no answer what to do instead of. I have a 10yr. Old Maltese with no teeth. Now I’m on a guilt trip what to do. I have been feeding her Cesar Home for years. Now don’t know what to do!!!! !